I’ve commented a few times recently about the inventory I’m conducting. I’m roughly a third of the way through the process: Common Elements and the book dedicated to Supergirl art are completely done, as is the book in which I keep miscellaneous odd-sized pieces that don’t fit well into the 14″ x 17″ Itoya Profolios I use for storage. At the moment, I’m halfway into the Bombshells! theme group, and will probably work on the Wonder Woman portfolio next. Two Fridays ago, we considered a piece I rediscovered as I delved through that miscellaneous stack. Here’s another I’d forgotten was in there. It’s a preliminary sketch by Barry Kitson, the British superstar who first made his mark in the UK on Judge Dredd. On this side of the Pond, Kitson’s pencils have elevated numerous properties for both major comics publishers, including noteworthy runs on Marvel’s Amazing Spider-Man and The Order, and DC’s Teen Titans, Legion of Super-Heroes, Batman: Shadow of the Bat, and Adventures of Superman. When I bought this sketch a few years back — and still more recently, when I stumbled upon it again — I had no idea why Kitson had drawn it. 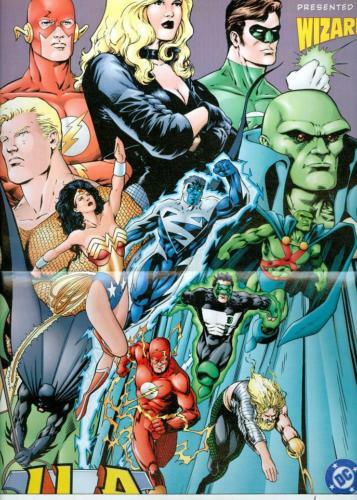 Thanks to another collector who posts to Comic Art Fans, however, I now know that it was a preliminary study for a mini-poster Kitson created for the late, more-or-less-lamented Wizard Magazine to promote DC’s then-upcoming JLA: Year One series, which Barry penciled. I found this image of the finished piece online, so you can see how it turned out once fully penciled, inked, and colored. I still don’t know who “Pete” is, to whom Kitson inscribed the prelim. Based only on the note, I’m guessing that “Pete” was a collector who bought some of Kitson’s JLA: Year One pages, and Kitson included the sketch as a bonus. Unfortunately, I didn’t record the identity of the person from whom I bought the piece, and given that I’ve slept several hundred times since then, I no longer remember. Somehow, I don’t think that person’s name was Pete, but I could be wrong. On the other hand, I remember quite well why I wanted the item in the first place, aside from the obvious fact that I don’t own anything else by Barry Kitson. My favorite comic series have always been supergroup and team-up books. I always felt I was getting more for my money when multiple heroes and/or heroines appeared on the cover of a comic. Thus, I gravitated toward books offering that benefit. 12. Metal Men. This unusual bunch consisted of six sentient robots invented by the brilliant scientist Will Magnus. Each robot was constructed primarily from a different chemical element, and manifested the unique properties of — and personality traits suggested by — his or her constituent metal. Gold, the team leader, was brave and noble, and could stretch his robot body into any imaginable shape. Iron was strong, both in physical power and in attitude. Lead was dense, literally and figuratively. Tin was weak and emotionally unstable. Mercury was — wait for it — mercurial. Platinum, usually called Tina, was a beautiful female robot with a passionate crush on her creator Dr. Magnus. (More recent reboots added a second female member, the sharp-tongued Copper.) The Metal Men’s adventures played as much for comedy as for drama, which was probably why I enjoyed them so much back in the day. 11. The Champions. Remember when you were a kid, and you had access to a self-service soda fountain? There was always the temptation to mix all the different flavors together in one cup, just to see what it tasted like. If you did that same thing with superheroes, you’d get the Champions. In the mid-1970s, Marvel writer Tony Isabella had the idea of putting together a bunch of second-tier characters who had nothing in common, just to see what would happen. Thus, we had Angel and Iceman from the original X-Men lineup, teamed with the demigod Hercules, the demonic motorcyclist Ghost Rider, and the Russian spy turned superheroine Black Widow. Yeah, that made no sense at all. And ultimately, it didn’t work — the Champions folded after just 17 issues. They were fun while they lasted, though. 10. New Warriors. Despite the name, there was never an “Old Warriors” or “Original Warriors” team. Which begs the question, Why not simply call this group “Warriors”? I dunno. Maybe they wanted to distinguish themselves from the street gang in Walter Hill’s classic movie, or from my favorite basketball team. And how long can you call yourselves “New Warriors” before you stop being “new”? Whatever the case, the New Warriors came together as a band of rebellious young heroes under the leadership of high-tech urban ninja Night Thrasher. Founding members included human rocket Nova, flame-wielding Firestar, aquatic Namorita, energetic Speedball, and Marvel Boy, who quickly realized how lame his code name sounded and started calling himself Justice instead. Today, the New Warriors are best known as the catalysts for Marvel’s epic Civil War crossover event. 9. Heroes for Hire. As is typical of Marvel’s superteams, the all-about-the-Benjamins Heroes for Hire have undergone more lineup changes than you can shake a no-prize at. Originally, the team consisted of Luke Cage, a.k.a. Power Man, and his martial artist pal Iron Fist. The Daughters of the Dragon — Misty Knight and Colleen Wing — often worked alongside the duo. Over the decades, the ever-shifting roster has mostly centered around Misty as de facto leader — sometimes in partnership with Colleen, but lately without — with support from a variety of morally ambiguous types, including most frequently the mercenary Paladin. Shang-Chi (Master of Kung Fu), the Black Cat, Silver Sable, and the Punisher are among the more prominent characters who’ve wandered onto and off the team at various times. Always an entertaining assemblage. 8. Suicide Squad. Similarly to Heroes for Hire, Suicide Squad has served as a focal point around which to gather some of DC’s more questionably heroic characters. As originally conceived, the Squad consisted mostly of former supervillains who agree to serve as covert government agents in exchange for clemency. At the head of the organization is the powerful and ambitious Amanda “The Wall” Waller, who manipulates the team to further her own shadowy objectives. In addition to out-and-out baddies as Deadshot and Captain Boomerang, the Squad also enlisted more typically heroic members, including Bronze Tiger, Nightshade, and Vixen. A noteworthy event in the Squad’s early history involved the death of its field leader, Rick Flag. 7. Legion of Super-Heroes. My comics-reading friends and I often referred to these far-future Superhero Scouts as “the Legion of Stupid Heroes,” for their propensity toward juvenile code names (male members were typically designated as “Boy,” “Lad,” or “Kid,” while females were “Girl,” “Lass,” or some similarly ridiculous feminine identifier) and ludicrous powers (illustrated most notoriously by Bouncing Boy, who was basically a human Spaldeen, and Matter-Eater Lad, who… well… I’m killing brain cells just thinking about him). But I loved the Legion in spite of their silliness, because their adventures were fun, their youthful enthusiasm and camaraderie were endearing, and you could tell that the writers didn’t take the whole business too seriously. Hey, remember that? When superheroes didn’t always have to be so depressingly serious? Man, I miss those days. 5. Justice Society of America. From the day I first discovered the JSA, I liked them better than their modern-day counterparts. For one thing, the original constituent characters are just so weird and loopy in that retro sort of way that you can’t help but dig them. I mean, come on — Hourman? A superhero whose powers run out in an hour? Who advertises that weakness to every villain he faces by making it HIS NAME? How do you not love that guy? Put him alongside the Spectre (a reanimated corpse who loves killing people in bizarre ways), the Sandman (“I’ll put you to sleep with my gas gun!”), the original Atom (who had no powers at all, aside from a heavy-duty case of Short Man Syndrome), and Doctor Fate (basically, Mandrake the Magician with a cool helmet), and you’ve got a recipe for comic greatness. The JSA’s present-day incarnation, with its ginormous cast featuring such stalwarts as Power Girl and the current Mister Terrific alongside holdover founders such as the original Flash and Green Lantern Alan Scott, has been fun too. 4. The Defenders. Billed as Marvel’s “non-team,” the defenders started with an unbeatable three-star core: the Hulk, Namor the Sub-Mariner, and Doctor Strange. The big three were soon joined by the cosmically powered Silver Surfer, plus a motley array of supporting players — most notably Valkyrie, Nighthawk, and Hellcat — who eventually came to dominate the stories. Unlike the aforementioned Champions, a cut-and-paste crew that never quite gelled, the Defenders’ nonsensical admixture of heroes pretty much always worked, even as the roster evolved to include such ill-fitting pieces as the Gargoyle and Damian Hellstrom, the Son of Satan. The former Justice League creative team of writers Keith Giffen and J.M. DeMatteis and artist Kevin Maguire reconvened the first four Defenders for a hilarious seriocomic miniseries in the mid-2000s. 2. The Fantastic Four. A squabbling family of superheroes — super-intelligent, emotionally distant dad; romantic but exasperated mom; brash kid brother; and gruff-but-lovable uncle — unlike anything that preceded them. The first comic book I can recall reading was a hand-me-down copy of Fantastic Four Annual #3. I was immediately addicted, as though the ink on the pages was suffused with crack cocaine. And it was the FF (quickly followed by Spider-Man) who sealed that addiction. They seemed so much like real people — unlike most heroes in juvenile fiction of the time, they fought and argued and teased and lovingly poked fun at each other, all while saving the world from galactic menaces. I wanted to be Reed Richards more than I wanted to be any other comic book hero until the arrival of the Black Panther: he was a super-genius with an insufferable ego and an answer for everything (hmm… know thyself? ), who saddled himself with the lamest code name in comics (“Mister Fantastic”? Really?) and got stuck with the least useful superpower on the team. 1. The Avengers. For me, the Avengers really came to life once the founding lineup — Iron Man, Thor, Ant-Man (who soon changed code names to the more impressive Giant-Man), and the Wasp, plus the Hulk, who took off after the first issue — dissolved. Captain America, thawed from his icy suspended animation in Avengers #4 and granted “founding member” status in the Hulk’s stead, was tasked with rebuilding the team from scratch, and made what seemed like incomprehensible choices for “Earth’s Mightiest Heroes”: Hawkeye, Quicksilver, and the Scarlet Witch, all reformed villains. The new mix of quirky, often conflicting personalities gave the stories more emotional heft. With the return of ex-Ant/Giant-Man Hank Pym (now called Goliath, and eventually Yellowjacket) and the Wasp, and the additions of Hercules, the android Vision (who married the Scarlet Witch) and the Black Panther, the Avengers developed into a premier team. The roster would change almost constantly from then on — I think practically every hero and heroine in the Marvel Universe has been an Avenger at some point or other — but the tradition was now firmly established. And that, superteam members, is your Comic Art Friday. Explore posts in the same categories: Comic Art Friday, Listology, Reminiscing, SwanStuff, That's Cool! This entry was posted on June 28, 2013 at 3:33 pm and is filed under Comic Art Friday, Listology, Reminiscing, SwanStuff, That's Cool!. You can subscribe via RSS 2.0 feed to this post's comments. You can comment below, or link to this permanent URL from your own site.